The Amscope Biological Binocular Microscope is everything I thought it would be. It's not nearly as nice as my brother's professional Olympus, but for the money, the Amscope can't be beat. The microscope comes with just about everything you would expect and then some. There is oil for the immersion lens, and two color disks to improve resolution when using the higher magnification settings, and a spare bulb. One thing that I was pleasantly surprised by is that not only can the width of the beam of light be adjusted with the diaphragm, but the condenser lens for the lamp can be focused. The combination of these two adjustments can create very crisp images at the dry 400x power, and the 1000x oil immersion is even more clear! The optics are good, but not great. If you want a clear image above 1000x then you will likely need to spend several times more money on a professional scope. The 20x eyepieces work fairly well, but the resolution is only slightly better than with the same objective and the 10x eyepiece. 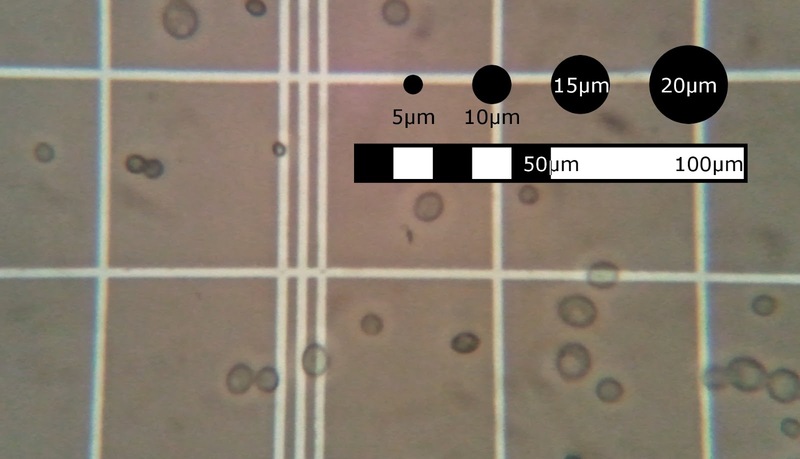 For counting yeast cells this scope is more than adequate. I am happy with my purchase. First off let me say that these photos don't do the microscope justice. It is much more clear when I was looking though the lens of my scope. These photos were simply taken by holding a cell phone up to the eyepiece. Unfortunately in my nice camera, the sensor is too far back in the body to work with this technique. 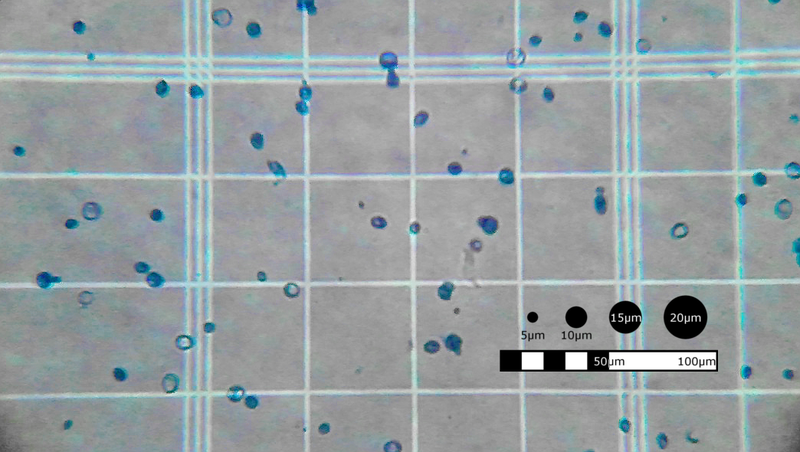 The blue cells are dead yeast cells that have absorbed the 0.2% methylene blue solution. It seems that even a 0.01% solution of methylene blue will work for counting viability, but a few minutes of incubation is required. 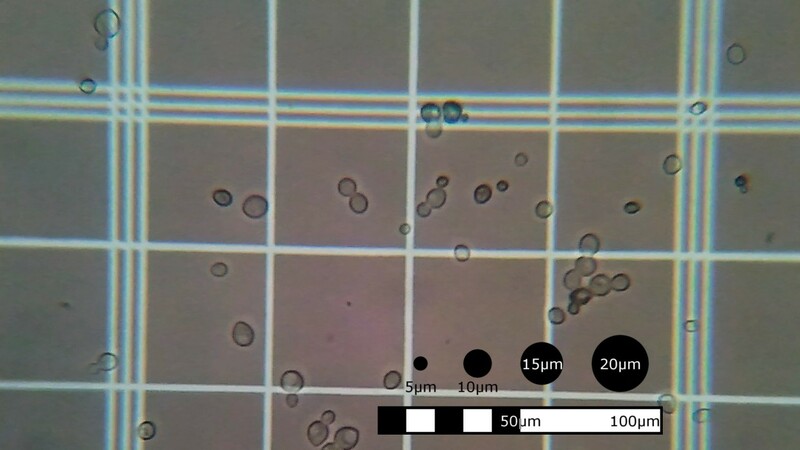 With a 1% methylene blue solution the cells could be counted almost immediately, but some of the live yeast cells seemed to be having trouble rejecting the dye. The White Labs recommendation of 0.01% is what I will likely be using from here on out. In the picture below and to the left, the sausage shaped cell is likely a bacteria. Luckily this was a rare find when looking at my yeast. 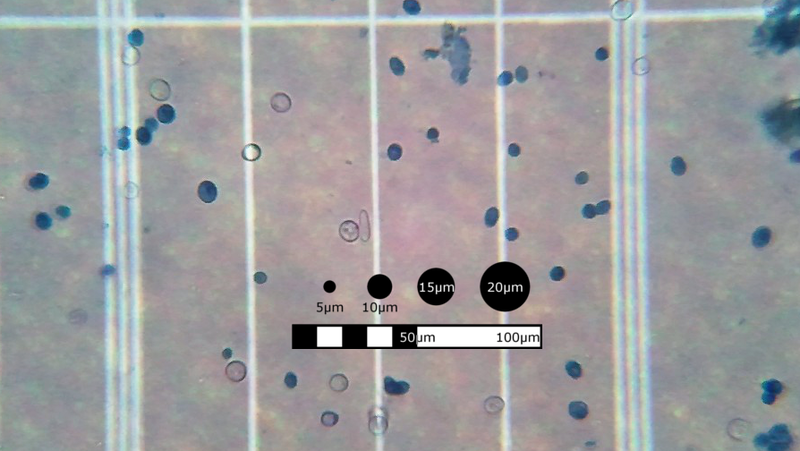 In the image on the right a different type of bacteria can be seen. It is about 5 microns long and you can just make out the filament and the body.